I took the overnight train from Paris and arrived early Sunday morning. 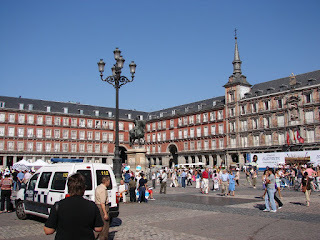 Madrid was beautiful and is supposedly the cleanest city in Europe. I believe it. Not as exciting as I had hoped but the fact that it rained both days and I was there on a Sunday and Monday may have been contributing factors. The Mayor Plaza was especially nice and there were sidewalk cafes everywhere. It rained too much to take many pictures.